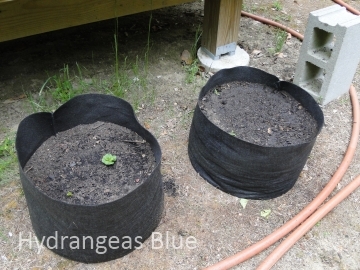 Last year I used these black fabric pots to plant vegetables in sunny locations in my small backyard. It was an experiment and I had no idea if anything would grow. But I needed a fairly easy alternative to digging up the grass. These fabric pots are not very expensive and I would think that they can be reused. I’ll see when I dig them out to use this season. I like the fact that they can be set wherever there is sun, but then they can be taken down. The smaller ones (shown in my pictures) I used to grow potatoes and beans. I ended up with a bowlful of edible, but small, potatoes. The bag is really too small to get much of a potato crop. They would do better in the ground, but I don’t have the space. I also grew green beans in two of the pots and I had loads of delicious beans! I will definitely try that again. The larger holder is where I planted tomatoes along with basil, some herbs and radishes. (I have a photo of that one on this page.) The tomatoes got too large to stay upright and the “pot” wasn’t deep enough to hold a wire tomato cage. By the end of summer my tomatoes had fallen over from their own weight. I also had planted too many of them. I wouldn’t put tomatoes in the bags again. I’m thinking a squash or zucchini plant may do well in a smaller pot and then it could drape over the sides and spread out. I always grow zucchini and even one plant takes up a lot of area in my little garden. The larger bag might hold my cukes, carrots or beets. I guess it depends on what I decide to plant. When summer was over and the harvest was in, I emptied the pots and stuffed them under my deck. I am wondering if I could leave the dirt in the larger one next time. I don’t know how it would do over the winter. If you want to try an easy way to grow something that can be moved from year to year, without digging up the ground, maybe a fabric pot would be right for you. For more ideas please read Discover the Benefits of Container Gardening by my friend Mike. It’s because of his page that I tried this! Thanks Mike!